There is a weekend discount of 10% (from 12.00 Friday to 12.00 Monday). Number of rooms - 2. 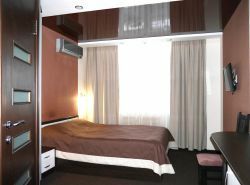 The interior of the double room comfort (1 category) in a modern style pleases the eye and gives a feeling of comfort. Rest on a comfortable bed with orthopedic mattress will be comfortable and complete. Check - out time of the hotel-12:00. You can order a transfer by comfortable minibus (maximum 7 people): railway station, bus station - 100 rubles/person; airport Pobedilovo - 400 rubles/person (can be included in the room rate). Tel: 8-800-550-45-03 (toll-free), +7 (8332) 54-45-03, Fax: 54-64-10.